The mere mention of this event elicits fears of the nuclear holocaust that almost was. For 14 days in October 1962, the two superpowers seemed destined to clash directly about the Soviet emplacement of Medium Range Ballistic Missiles (MRBMs) and Intermediate Range Ballistic Missiles (IRBMs) in Cuba. To prevent the installation of additional offensive weapons in Cuba, John F. Kennedy declared a naval quarantine around Cuba. Tensions reached a near breaking point when a U-2 flight was shot down over Cuba, and Khrushchev demanded US missiles be removed from Turkey in exchange for Soviet missiles being removal from Cuba. Ultimately, Khrushchev was compelled to settle for a US pledge not to invade Cuba, and a private agreement to resolve NATO’s missile bases in Turkey. It prevents the opponent from further coups without removing influence from Turkey/West Germany or Cuba. Now, as US, it is not usually a big deal to remove two from Turkey or West Germany: you’ll almost always have at least two influence in one of those two countries, and removing influence is not a big deal for either of them. The USSR is unable to play DEFCON-raising cards (in particular the USSR is now unable to trigger SALT Negotiations or ABM Treaty) without allowing the US several easy coups. The US can spread freely through non-battlegrounds without fear of being couped. Of course, the USSR can reap some of these benefits as well (it is nice not to have to worry about Nuclear Subs! ), but it is rare for the US to have no influence in either West Germany or Turkey. Even if the USSR does control Cuba, a Cuban Missile Crisis headline is still pretty annoying, because losing 2 influence in Cuba makes it quite vulnerable. Finally, Cuban Missile Crisis is a decent headline if you anticipate that your opponent’s headline will lower DEFCON and be subsequent to yours. For example, as US, if the USSR headlines Olympic Games (or Missile Envy, and you hold We Will Bury You), then a Cuban Missile Crisis headline will win you the game. The text of Nuclear Subs (which confusingly reads “Does not affect Cuban Missile Crisis”) simply means that a US player with Nuclear Subs is not immune from the effects of the Cuban Missile Crisis. Cuban Missile Crisis applies to all coups, including “free” coups (through Junta or Tear Down This Wall). This entry was posted in Mid War, Neutral Events and tagged cuban missile crisis. Bookmark the permalink. Regarding the explicit timing, I don’t know if it has anything to do with sportmanship. The US player is totally aware of the possibility. And at least he forces the USSR to decide. But of course the USSR should not be able to remove 2 IP after a successful US coup or realignment die roll which removes so many IP that the USSR has got only 1 (or none) left. Is there no explicit ruling on this? I read through the BGG forums and found no definitive ruling. For instance, it seems unfair for the USSR to announce that he will be removing the 2 influence after the US plays a card for Operations and announces a realignment of Cuba, even if he tries to remove the influence before the realignment. Is the US forced to go through with the Cuba realignment? Is the US forced to realign another target? Can the US take back the play entirely and do something else? What if the US used a USSR event for this realign and no longer wants to use that USSR event? Good points. I already wrote to Randy Pippus and Ron Jacobsen regarding this issue. Randy is quite close to the designers, so let’s hope there will be an official ruling soon! By the way, a few days ago I won a match in such a way. As the USSR I was hit by CMC and my opponent played Lone Gunman. I removed 2 IP out of Cuba and sent the DEFCON to 1. In my opinion this move should stay possibble, since the US is totally aware of this possibility. In fact the same counts for all attacks against Cuba. The US knows that the USSR is allowed to remove IP out of Cuba. So when they attack them, they take a certain risk. Anyway, I understand your points and I also hope there will be a loud and clear clarification. I think Lone Gunman is different — there, because the USSR gets to execute an event, the USSR is choosing to precede its own event with a CMC cancel. But it is another thing to “intercept” your opponent’s event. I think we still stick to the description on the card: it says “at any time”! Therefore in my understanding, the Soviet should be allowed to remove 2IP from Cuba even if the US has already initiated a Cuba coup or realignment, but certainly not after the US has already successfully removed Soviet IP. Allowing this doesn’t seem to hamper game balance anyways. Yup, this is also the way I think the card works and should work, but at least it should be made clear that a realignment roll consists of simultaneous rolling a die by US and USSR to prevent the USSR removing 2 IP out of Cuba after for example rolling a ‘1’ (or an American ‘6’) and before the other side made their roll. I agree with the “any time” interpretation; but yeah, you’re definitely not allowed to see what your opponent rolls for his coup/realignment before you do it! I’m not a fan, personally. I can see letting the USSR player do it in-between realignment rolls, perhaps, but if the USSR player is allowed to remove in response to a declared realignment roll against Cuba but before the die is rolled, that seems a strong incentive for the US to stare at his cards for awhile, grab the die, toss it in the air, then drop a card and quickly say “realigning Cuba!” to lock the USSR out of this option ….which would be silly. 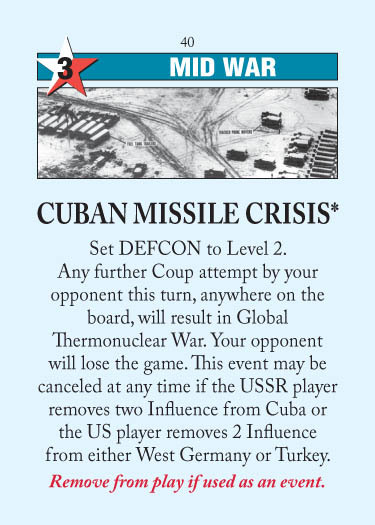 I always thought that Cuban Missile Crisis forbade coups for everyone, and the card was just awkwardly phrased with the “your opponent” parts. (Why else would both players have the option to remove influence? Clearly it must affect both players.) Seems kind of out of flavor that you can go around starting coups and not triggering the nukes while your opponent needs to spend the influence. Anyway, learned a new thing, hooray. Yeah, it just forbids your opponent couping but of course, the action sets Defcon to 2, so you have to play a Defcon increaser/Nuclear Subs before you can have a coup bonanza in Africa. It seems like there should be a “The Bay of Pigs” starred event card which has some sort of effect on this. To me, the Bay of Pigs affair can be represented as a coup on Cuba with a low ops card. In the game, as in real life, not a good idea. Nah, it’d play more like Thatcher the Betrayer – ostensibly US, really helps the USSR. Does “at any time” cover a time between two realignments of my opponent provided that he realigned first but did not announce what does he want to realign next? See the other comments and the post. Someone tried to argue that you could play 2 into Cuba (after the event activates), then take 2 away, which technically fulfilled the requirement but retains control. This seems like a fairly ludicrous interpretation but wanted to check with others. This is fine and is how I play – USSR has to waste a turn playing then removing 2 OP which seems a fair trade off. Question: when CMC is removed (after turn ends or after someone removes IP) the DEFCON remains at 2? Hi, did you get a response to your last point? Imagine a Soviet player, where US previously played “Cuban Missile Crisis” in the turn. Subsequently, either the event “De-Stalinization” occurs (when Cuba is NOT US-controlled) or “Liberation Theology” (US control of Cuba being irrelevant) occurs. The text on “De-Stalinization” says “USSR may relocate up to 4 influence points to non-US controlled countries. No more than 2 influence may be placed in the same country.” The text on “Liberation Theology” says (the Soviet player to) “Add 3 influence in Central America, no more than 2 per country.” In either event, first, the Soviet player first elects to put two influence in Cuba. Second, the Soviet player removes that same two influence from Cuba to cancel Cuban Missile Crisis, since that can be done at any time. Third, the Soviet player places 1 influence in Cuba to finish the “Liberation Theology” event (or places 1 or 2 influence in Cuba to finish the “De-Stalinization” event). The Soviet player never put more than 2 influence in the same country, Cuba, because the first placement of 2 influence were removed by opting to cancel Cuban Missile Crisis. I’ve heard valid arguments from both sides that this particular scenario is either wrong or right. Personally, I’ve actually had it come up in a game where it made since for the Soviet player to do this (with “Liberation Theology” in particular). Does either GMT games, or the game designers Ananda Gupta or Jason Matthews have an official ruling on this particular scenario? I don’t have an official ruling, but that seems ridiculous to me. You’re adding more than 2 influence to Cuba, even if some of it’s taken away in the middle of the process by an unrelated effect. The text says “No more than 2 influence may be placed in the same country.” or “Add 3 influence in Central America, no more than 2 per country.”. For me, if you placed 2 influence in Cuba, you will not be able to put more influence in Cuba. I mean, you already put two influence in Cuba, take them away does not mean that you should be able to put a third one.